What if, instead of basing policy around the presumption that people will drive more every year, transportation agencies started making decisions to reduce the volume of driving? And what if they succeed? A new report from the Massachusetts Public Interest Research Group quantifies what would happen in that state if driving rates come in one percentage point lower than the state DOT’s current annual projections. For instance, in a year that the DOT forecasts 0.49 percent growth in driving, MassPIRG hypothesizes a 0.51 percent decrease. 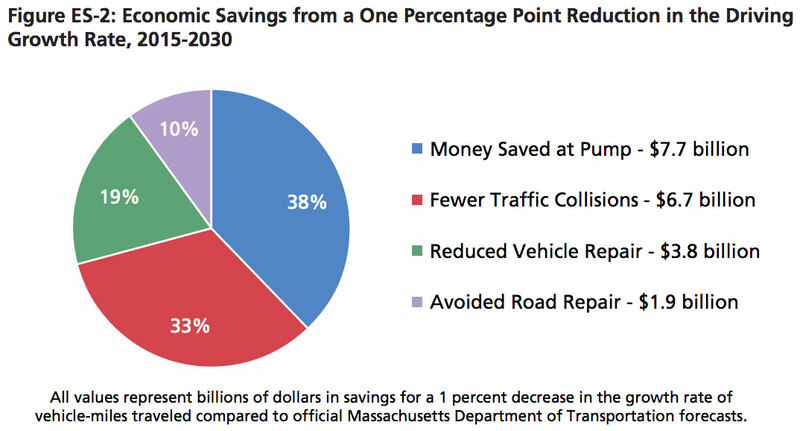 MassPIRG estimates that the statewide effect from now until 2030 would add up to about $20 billion in savings and 23 million metric tons of carbon emissions avoided. The effects grow as the decline compounds over time. In the first year, a one percentage point change in driving rates would save about $167 million in avoided costs of gas, road repairs, and traffic collisions. By 2030, the savings would rise to $2.3 billion per year. Broken down by category, the state would save about $1.9 billion on road repairs over the 15-year period. Drivers would net $3.8 billion in savings on car repairs and another $7.7 billion on gas purchases. And auto collisions would cost $6.7 billion less to society, as people avoid medical expenses, property damage, and lost wages. The environmental benefits would be significant, with a reduction in carbon emissions rising from 226.3 thousand metric tons in 2015 to 2.4 million in 2030. While Massachusetts has set a goal to triple the amount of miles traveled by transit, biking, and walking by 2030, the state will need more aggressive policies to achieve the kind of mileage reductions outlined in the report, MassPIRG says. The organization recommends that the state adjust its criteria for deciding which transportation projects to build to more strongly emphasize public health, the environment, and social equity. How about the savings in health care costs due to fewer car drivers poisoning and killing people? Hard to quantify but I think fair to say that it’s massively underestimated both in terms of savings for driving less, and expenses of driving more. We wanted to measure that in the report, but didn’t feel like the data allowed us to make those estimates with enough confidence. There’s a national estimate from MIT researchers of 53,000 premature deaths a year from this effect. But it’s not clear how many of those deaths to attribute to Massachusetts, or whether the effects of pollution are such that each 1% reduction in driving miles yields a 1% reduction in these deaths. This seems really interesting – it seems to imply that we spend nearly as much dealing with traffic collisions as we do on gas. But everyone thinks the price of gas is something that affects them, but the price of traffic collisions is something that only affects random unfortunate other people. Putting it in the aggregate like this helps illustrate things. Modern cars are surprisingly clean these days in terms of toxic chemicals let out of the tailpipe. Since 1998, EPA standards have cut pollution from cars and trucks by 90%. Tier 3 standards will improve this even more soon. If you’re worried about toxic chemicals in the air, the things to focus on are marine shipping, commercial trucking, and industrial pollution. I think that focusing on private automobiles may yield diminishing returns. Reduced healthcare cost of pollution, as well as reduced healthcare costs associated with all the additional walking and biking people would need to be doing to bring down VMT. They should really be looking to carpooling to achieve some of those reductions – in addition to transit and walking and cycling. I agree with the underlying idea that for someone to try something new they need to think the quantum of the reward will be large enough, and that there is a reasonable expectation of success. Here we see the quantum of the reward. We also need to see promotion of experimentation to find ways to increase the expectation of success. I’ve commented on this before in various places: “Healthcare” would be more accurately called “Disease treatment”. Unfortunately, a lot of really old cars are still on the road, particularly driven by poorer people. Though commercial trucks are a bigger problem. The newer cars with all the pollution controls are more expensive upfront. I disagree, the average age of a car on US roads is 11.5 years. That’s the 2004/5 model year. Those cars are pretty clean.